After years of work with the county, and in response to numerous requests from the community, Dana Point will soon have a new way to cross Coast Highway from the foot of the Palisades to Doheny Beach. The county of Orange has proposed the demolition of the aging bridge and replacement with a fully signalized crosswalk replacing the span of the bridge over Coast Highway. The project would eventually be followed up in the future with a separate project—the replacement of the portion of the bridge over the Orange County Transportation Authority/Metrolink railroad tracks with a new span, complete with elevators. Provisions of the agreement include full funding for and construction of the project by the county and upon completion, returning ownership to the city, according to the agenda report. The property would also be “given” to the county while it does the improvements, as required by state code. Known formally as the Capistrano Surfside Inn Pedestrian Overcrossing, the current two-span pedestrian bridge was built by the Surfside Inn —prior to 1989 city incorporation—as a California Coastal Commission condition of development to provide coastal access. The county-owned bridge, located in front of the inn between Palisades Drive and Doheny Park Road, has aged to the point where replacement is necessary, according to county officials. In addition to corrosion, concrete delamination and spalling (cracking, pitting and flaking), the bridge is also not compliant with the 1990 Americans with Disabilities Act because it only has stair access. A project report prepared by the county with input from the city and finalized in 2013. Concluded the best, most cost effective option was a two-phase plan beginning with an at-grade signalized street crossing and followed by a new bridge with elevators to be constructed over the railroad tracks. On April 19, City Council approved a cooperative agreement with the county for Phase 1 of the project—demolition of the existing span of bridge over Coast Highway, and replacement with a crosswalk. Construction of a bridge with elevators over the tracks will come later, as Phase 2 of the project. That existing section of the bridge will be preserved until then, according to the staff report. Fowler said the community has been asking the city to do some traffic calming along that stretch of roadway. City Manager Doug Chotkevys added that in the case of the Dana Point bridge, that project was done specifically to get people off the street to provide better traffic flow, whereas a crosswalk in this area is needed in order to provide traffic calming and a safe, ADA-friendly crossing. Muller also expressed concern with regard to taking on safety liability for the new crosswalk when the county turns the completed project back over to the city. “The county seemed unwilling in the past to do the project unless the city took over,” Fowler said. Councilman Scott Schoeffel noted he attended many of the past meetings with the county and knows the crosswalk plan was run past CJPIA (California Joint Powers Insurance Authority), the risk pool through which the city is insured, and they didn’t have a problem with it. Mayor Pro Tem Richard Viczorek said he didn’t fully understand the county’s position in saying they would not proceed with the project, letting the bridge exist in its present state unless Dana Point agrees to bail them out. Viczorek asked what would happen should the city not agree to take it over. “What if we don’t approve this,” he asked. City Council voted 3-1, with Councilman Richard Viczorek casting the no vote. Mayor John Tomlinson recused himself from the vote due to a possible conflict of interest as the owner of property within 500 feet of the area. Upon council’s approval, the matter was added to the May 9 Planning Commission meeting agenda, when the commission will consider the Coastal Development Permit for the crosswalk and signal. 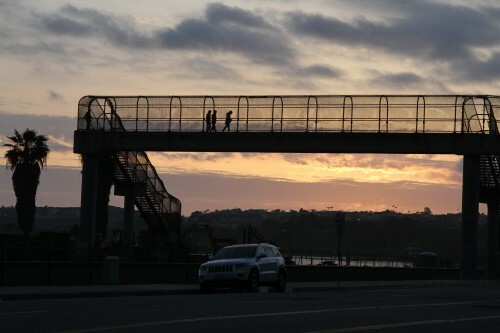 According to Fowler, the crosswalk is within the authority of the city, and Planning Commission’s CDP consideration will be followed by Coastal Commission review of the bridge demolition portion of the project, tentatively set for June. As for Phase 2, Fowler said that because the funding status of that part of the project is unknown, no estimated timeframe is set for the demolition of the replacement of the portion of the bridge over the railroad tracks. I love infrastructure upgrades for a lot of reasons. I suppose we’ll find out eventually but it sounds like a signal controlled crosswalk might be another bottleneck at a point that’s already incredibly frustrating in summer traffic. Why not just replace it with a modern attractive structure that allows unimpeded crossing for pedestrians and bicycles while not forcing traffic to needlessly backup as people cross? Maybe a crossing bridge could be a view site as well? I don’t know. Hopefully this will improve flow and safety and be a timelessly beautiful structure as well. I am an owner at both Capistrano Surfside inn and at neighboring Riviera Beach & Spa timeshares. Our family spends 2 weeks at those timeshares each summer and looks forward to the outlined improvements. I have developed serious health problems in recent years and can no longer climb the existing bridge. The article made no mention of whether building a tunnel under the train tracks there would be a feasible and perhaps cheaper option to replacing the bridge with a new bridge and 2 elevators. I think we all know the congestion issues near Doheny beach during summer and the resulting need for the bridge crossing there (not to mention it is a great visual coming into the city). The bridge at Hole in the Wall is obviously old and does not adhere to ACA requirements. However, replacing it with a signal is, in my opinion, a bad move. Summer traffic will create additional grid lock this area of the coast does not need. In addition, I believe it significantly creates unnecessary risk, both to crossing pedestrians and to occupants of vehicles. There is just too much to look at in that stretch of road, not to mention, lost tourists looking for their hotel\timeshares. Have we forgotten the accidents and injuries\deaths on or near that area from lack of attention, carelessness or under the influence driving? I would have to agree with Councilman Muller. Replacing the bridge with something along the lines of the version we have on PCH near Doheny would seem to be the better option.